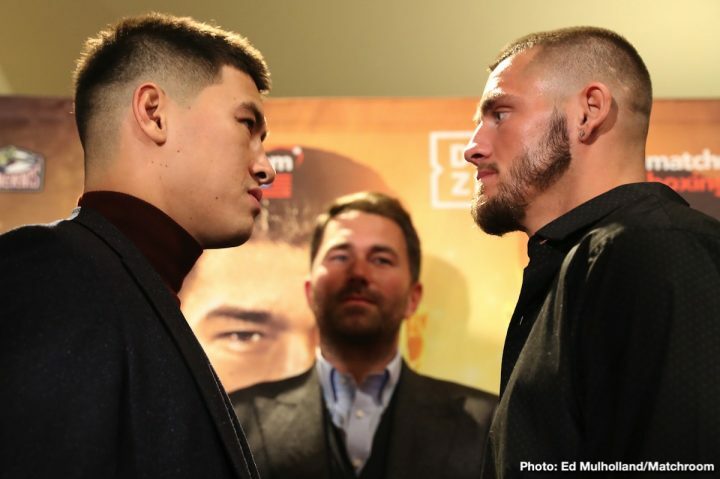 By Mike Smith: Dmitry Bivol is looking sharp ahead of his title defense next month of his WBA light heavyweight belt against Joe Smith Jr. (24-2, 20 KOs) on March 9 on DAZN at the Turning Stone Resort & Casino, in Verona, New York. Bivol, 28, is working on different drills to increase his speed and punch accuracy for his fight against the dangerous 29-year-old Smith. With Bivol now fighting on DAZN and working with Matchroom Boxing USA promoter Eddie Hearn, it puts him in the position where he could potentially get fights against the likes of WBA Super World champion Callum Smith and Saul Canelo Alvarez. Bivol would have to come down to 168 for either of those fights to happen. To get a fight against Canelo, would be huge for Bivol. It would make him known overnight by boxing fans in the U.S and world over. Whether Canelo’s promoters at Golden Boy Promotions would allow him to fight Bivol is another thing. Bivol hits hard, and he’s said to have punching power similar to former middleweight champion Gennady Golovkin. Bivol has a bigger frame than Golovkin, and that factors in with him having similar punching power. Right now, Bivols’s power isn’t carrying him as far because he’s fighting at light heavyweight where the guys hit harder in that division. If Bivol moves down to 168, his power could be more pronounced in that weight class. Bivol sparred recently with former WBC super middleweight champion David Benavidez in a sparring session that was said to have an exciting one to watch. Benavidez, 6’1 1/2″, is a guy that is big enough to fight in the light heavyweight division. You can argue that Benavidez is more well suited for 175 than Bivol due to his size and punching power. Bivol isn’t a huge puncher. He’s more of a pure boxer/volume puncher. Bivol (15-0, 11 KOs) says he wants to fight all the champions at super middleweight and light heavyweight. There’s talk that Bivol drop down in weight to compete at 168. Although listed at 6’0″, Bivol looks to be more in the 5’10” range. The way that Bivol was extended the full 12 rounds in his last two fights against Jean Pascal and Isaac Chilemba suggests that his punching power isn’t good enough at light heavyweight for him to knockout that he’s facing. It might be a better move for Bivol to move down to 168 on a permanent basis in order to get the most out of his career. If Bivol stays at 175, he’ll likely need to fight a lot of 12 round matches to get his victories because of his power not being devastating at that weight. That means Bivol will take more accumulated punishment in winning his fights at 175 than he perhaps would if he moves down to 168 to compete against guys that he can hurt with his power. This would be a great move for Bivol to campaign as a super middleweight. It would put him in position to fight guys from both the 160 and 168 lb division. Bivol being on DAZN and paired with Matchroom would open up a lot of opportunities for big fights against the guys that are on that platform. That means Canelo, Callum Smith, Demetrius Andrade and possibly even Golovkin if he elects to sign with DAZN as well. Those are some great fights that boxing fans could be seeing in the future potentially if Bivol makes a permanent move to super middleweight. Boxing » News » Dmitry Bivol looking good preparing for Joe Smith Jr.